Ukrainian President Petro Poroshenko departs after honouring Ukrainian servicewoman Nadiya Savchenko with a Hero of Ukraine Golden star in Kiev, May 25, 2016. Some believe that the exchange of Ukrainian pilot Nadiya Savchenko for two Russians who participated in the armed conflict in the Donbass, is a sign of an upcoming improvement in Ukrainian-Russian relations. RBTH spoke to several analysts to find out if there are grounds to think so and looked at the main scenarios for how relations between Moscow and Kiev could develop over the situation in eastern Ukraine. 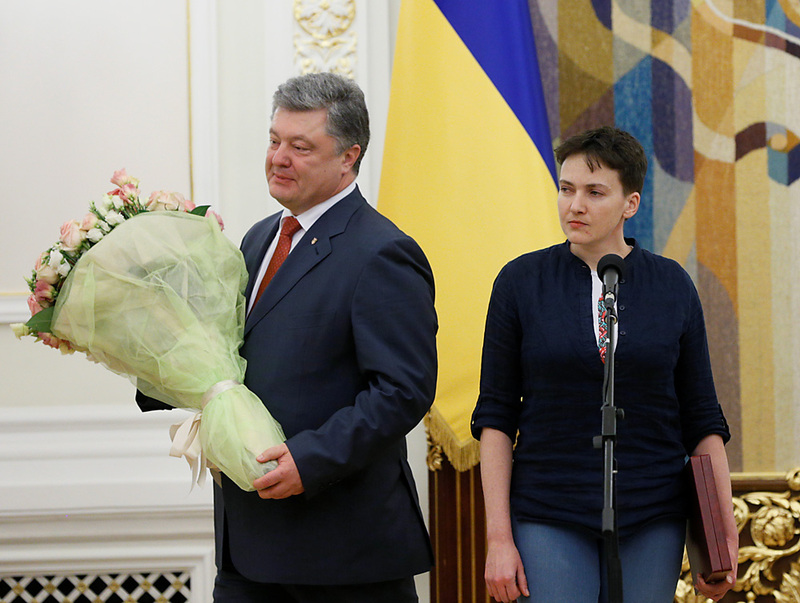 Ukrainian pilot Nadiya Savchenko returned to Kiev as a national hero on May 25 after spending almost two years in a Russian jail on charges of being responsible for the deaths of two Russian journalists in the conflict in eastern Ukraine’s Donbass region. On the same day, Alexander Alexandrov and Yevgeny Yerofeyev, two Russian citizens suspected of being members of Russia’s armed forces returned to Moscow after being convicted of terrorism following their capture in eastern Ukraine. What does this prisoner exchange mean for Russian-Ukrainian relations and how may events unfold in the future? Those who think that we may soon see improvement in Russian-Ukrainian relations are convinced that Savchenko's release and the prisoner swap is not an isolated event but part of the set of agreements concerning the Donbass conflict that was agreed upon by the leaders of Ukraine, Russia, Germany and France in Minsk in February 2015. In the opinion of Andrei Yermolayev, a Kiev-based political analyst and director of the New Ukraine Institute of Strategic Studies, "the exchange is a sign that the formal Minsk Agreements, as well as informal agreements regarding the regulation of the conflict in the Donbass, are beginning to be implemented." - creating a format for permanent dialogue between Russia and Ukraine. At the same time, even if the leaders of the four countries have already agreed on these measures, the problem now is that Ukraine’s parliament, the Verkhovna Rada, must approve them. And large parts of the Rada categorically against making any agreements with the Donbass. Yermolayev believes that it is possible to convince the more radical deputies, but for this to happen "all advocates of the peace process must become very active" and start "working with the parliamentarians." A breakthrough on the Donbass would radically change relations between Moscow and Kiev, said Yermolayev. By far not all experts believe that such optimism is grounded. Kiev is unlikely to make compromises on the Donbass, says Boris Shmelev, head of the Center for Political Studies at the Russian Academy of Sciences’ Institute of Economy. In his view, by signing the Minsk agreements, Ukrainian President Petro Poroshenko placed himself in an ambiguous position since it will be extremely difficult, if not impossible, to implement them. Even if he is able to pass the necessary laws through parliament, this will be followed by a political crisis "with unforeseeable consequences." It is possible that the affair will end with new elections, after which more radical politicians will enter the Verkhovna Rada. The current dead end, according to Shmelev, is based on the fact that in Ukraine anti-Russian sentiment can be felt not only in parliament but also in a large part of society – which he claims is due to the country having been able to shape public opinion. For this reason, he does not expect the prisoner swap to lead to any breakthroughs in Russian-Ukrainian relations. The third scenario also stems from the opinion that the prisoner swap will not have any far-reaching consequences. In fact, it is even possible that Russian-Ukrainian relations will further deteriorate to the point of a complete rupture, but only with the renewal of combat activity in the Donbass. Shmelev believes that this will happen if "Russia is dragged into combat activity more or less directly." At the same time, in the opinion of Yury Korgunyuk, a liberal expert from the independent INDEM Foundation, relations between Kiev and Moscow are so damaged that there is no sense in speaking about their further deterioration. But Kiev, in Korgunyuk's view, is not interested in a final rupture since Ukraine is still heavily dependent on Russia. This also concerns the conflict in the southeast, since as he points out, "a part of the Donbass is under Russia's control." By denying independence to the breakaway Donbass “republics” of Donetsk and Lugansk, says Korgunyuk, it is Moscow that holds the key to resolving the conflict.